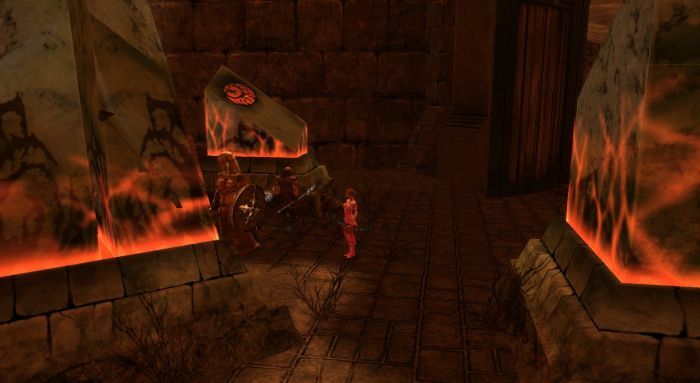 Wayfarer’s Reverie #GuildWars #GW – Nomadic Gamers, eh! ArenaNet added a new festival to the world on Friday, the Wayfarer’s Reverie. This is a celebration of exploration (and in preparation of GW2). The Wayfarer’s Reverie honors the traveler inside each of us, encouraging revelry and revisitation. The world is yours to explore—again or for the first time. Join the celebration! I picked up the quest in Lion’s Arch to explore Tyria, and set out to explore. The lower level areas were quite easy, and I had no issues soloing my way through them, picking up some spare crafting material and money. I had a lot of fun wandering through areas I had not been in for quite some time. Of course, it got harder. Much harder. Visit the Searing crystal near Serenity Temple. Visit the Mausoleum in Majesty’s Rest. Visit the Falls in the Maguuma Jungle. Visit the ancient temple of Lyssa in Mineral Springs. Visit the ruined statues of the Arid Sea. See Festival Coordinator Teron for your reward. Before I knew it, it was 1:30am and I was practically falling asleep at my keyboard which never bodes well for my heroes (or myself) so I gave up on the location I was trying to get to, and called it a night. When I had logged in to play I was pleasantly surprised to discover that it was my character’s 4th birthday, and I had a new miniature to add to my Hall of Monuments, the miniature Nian, which is an uncommon. Looks pretty good in my collection, too. There’s no way I’ll get anywhere near 30 points by the time Guild Wars 2 releases, but I’m not going to stop trying, and might be able to eek out another point or two here or there. We’ll just have to see. In the mean time I’m still in awe at how beautiful this game looks, especially for its age.